Ronda Rousey appeared on Ellen this morning to discuss her transition from the UFC to pro wrestling. During the interview, host Ellen DeGeneres asked Rousey to explain the differences between the two careers and why she made the change. 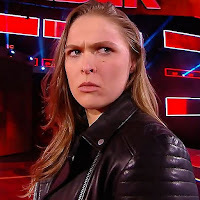 "WWE, I describe it as a live TV show about a wrestling tournament where everyone does their own stunts," Rousey said. "It's not fake fighting, it's scripted. So when I got slapped across the face [by Stephanie McMahon on RAW], that was a real slap, there's no real way to fake that." As for the major difference between WWE and the UFC, she said that WWE was like a team, while UFC and judo were individual efforts. She explained that everyone in WWE works together to make the show as great as possible. Rousey noted that she's been keeping her WWE career secret, and that she's been training for awhile. She talked about her surprise appearance at The Royal Rumblein January, noting that she had to fly commercially from Columbia where her movie, Mile 22, is being filmed. She said that she put on sunglasses, a beanie and a hood and was surrounded by police, which made it appear like she had gotten busted for drugs. When asked if she would eventually go back to the UFC, she said that she didn't know and it would be like returning to the Olympics for judo. "I'm just doing what I enjoy and WWE is what I enjoy right now," Rousey said. 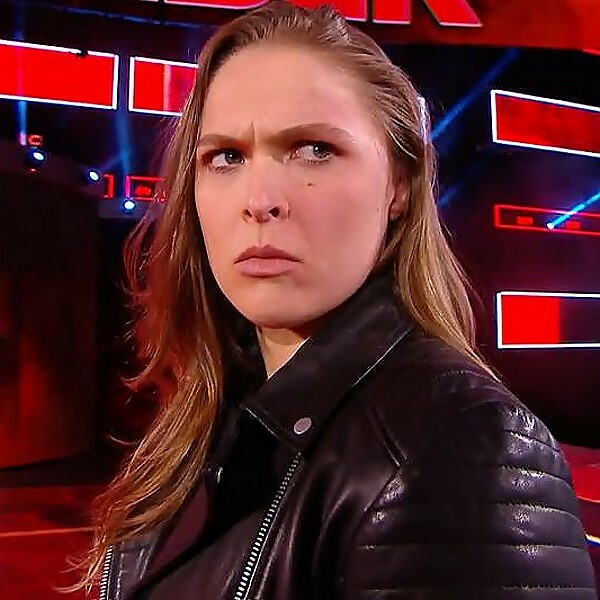 Rousey talked about teaming with Kurt Angle to face Stephanie McMahon and Triple H at WrestleMania 34. Rousey admitted that she's nervous, but it's not like she's "Olympics nervous." She noted that the worst thing that could happen is that she'll look stupid, which isn't so terrible. "I can't think of the last time I was so excited for anything, [where] I'm like really looking forward to it," Rousey said. Rousey finished the interview by revealing how she makes her trademark scowl. She said that her godfather taught her to look through her eyebrows, which is what she does. You can watch the full interview in the video below.